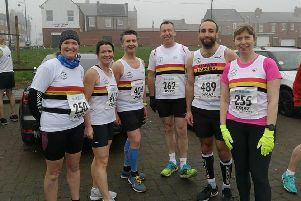 Strong winds made the going tough for Alnwick Harriers who represented the club at the weekend. Despite the tricky conditions, there were some great performances, including from rising star Millie Breeze, who won the U15s girls’ race at the penultimate North Eastern Harrier League fixture at Thornley Hall Farm, Peterlee, on Saturday. Millie won the fixture from the fast pack, crossing the line in 14.40 – nine seconds ahead of Gateshead Harrier Ines Curran. Millie’s performance sees her second in the Girls’ U15 Individual Grand Prix, with just one meeting to go – Alnwick in March. Millie was one of four Junior Harriers who made the trip to Peterlee, with James Carragher and Joseph Godden (U15 boys) and Evie Godden (U13 girls) all running well in the difficult conditions. In the men’s race, the team finished 10th on the day in Division Two, leaving them 8th in the league. First back for Alnwick, running strongly from the medium pack, was Bruce Crombie, finishing 104th in 42.46. Next were two fast-pack runners in the form of Graham Simpson (43.16) and Steve Carragher (43.59). Medium-packer Adam Fletcher was fourth back for Alnwick in 44.10, followed by fellow medium-packer Jon Archer in 45.51. Sixth for Alnwick was Ian Stephenson, who crossed the line in 56.46 from the slow pack. In the women’s contest, Alnwick finished 10th in Division One, leaving them at the foot of the table. There was a strong turn-out from the north Northumberland lasses. Leading the way was Mel Steer, from the slow pack, who finished in 35 minutes exactly. She was followed by three medium-pack colleagues – Lisa Baston (35.47), Karen Kelly (35.48) and Jo Powell (37.32). Alnwick’s other runners, all from the slow pack, were Emma McGee (38.53), Jennifer Knight (42.36), Linda Patterson (46.08), Lorna Stephenson (47.09) and Jan Chisholm (49.42). Away from the thrills and spills of the cross-country, a number of Alnwick Harriers were in parkrun action. At Druridge Bay, Robert Baddeley was first home for Alnwick, finishing 9th overall in 21.55. The club’s Carole Page was the winner of the women’s race, crossing the line in 21.59. Results: 9 Robert Baddeley 21:55; 10 Carole Page 21:59; 28 Neil Hamilton 24:00; 41 Chris Stewart 25:34; 53 Peter Embleton 26:20; 73 David Cooper 28:34; 78 George Williams 28:57; 95 Nell Gair 30:25; 107 Rebecca Heeley 31:27; 113 Eleanor Heeley 32:12; 114 Karen Leeson 32:17. At Alnwick, there were some good results at the Pastures parkrun. Mike Telfer was first back for Alnwick, finishing fifth overall in 22.48, while Ian Horsley was one place behind in 23.24. Emma Givens put in a decent performance to finish second in the women’s race, crossing the line in 27.13. Results: 5 Mike Telfer 22:48; 6 Ian Horsley 23:24; 13 Christopher Atwell 26:58; 15 Emma Givens 27:13; 18 Keith Shotton 27:25; 25 Peter Lindley 29:11; 40 Helen Dickinson 31:54; 44 Louise Syers 33:28; 45 Graham Syers 33:30; 52 Alison Hutchings 35:53. Elsewhere, Melanie Brigid Buchanan ran at the Kirkcaldy parkrun for the first time, finishing in 30.18, while Richard and Gay Eastoe were once again at Workington, clocking 29.55 and 41.55 respectively. Before the weekend, there were some outstanding performances by the club’s younger members. On Thursday evening, at the Gateshead Indoor Athletics Meeting, Talia Thompson threw another Alnwick Harrier club record-breaking distance of 10.44m in the shot put. The Amateur Athletics Association grade the top performances in all track and field events and award both senior and junior athletes with the best performances. Talia’s exceptional throw has earned her grade 1 recognition – a standard that has not been achieved within the club at senior or junior level since 2011. Furthermore, she is only the third athlete in the club to ever perform at such a high standard. Talia has trained hard throughout the winter, travelling to Gateshead twice a week for additional coaching. The summer season is still almost three months away, so achieving such a fantastic throw is very positive and she promises to have a very successful season. Meanwhile, Leila Thompson also broke her own club record on Thursday and won the U13 girls’ competition. A fantastic set of result for the sisters!